Art Returns Home is something you should read. The following was written by By Peggy Sanders, Board Member, CCC Museum of South Dakota and was included in National New Deal Preservation Association Winter 2018 News and the South Dakota State Historical Society January/February 2018 Hoofprints. The CCC Museum of South Dakota has acquired an original oil painting created by 24-year-old CCC artist, Morris (Moe) Gollub. 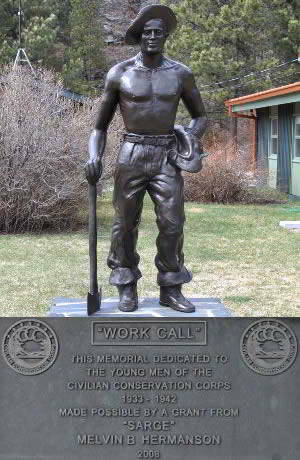 Gollub was assigned to Camp Pine Creek, S-1, Co. 1793 from May 29, 1935 - September 30, 1935. The painting is a tribute to the men who were in the camp with Gollub. 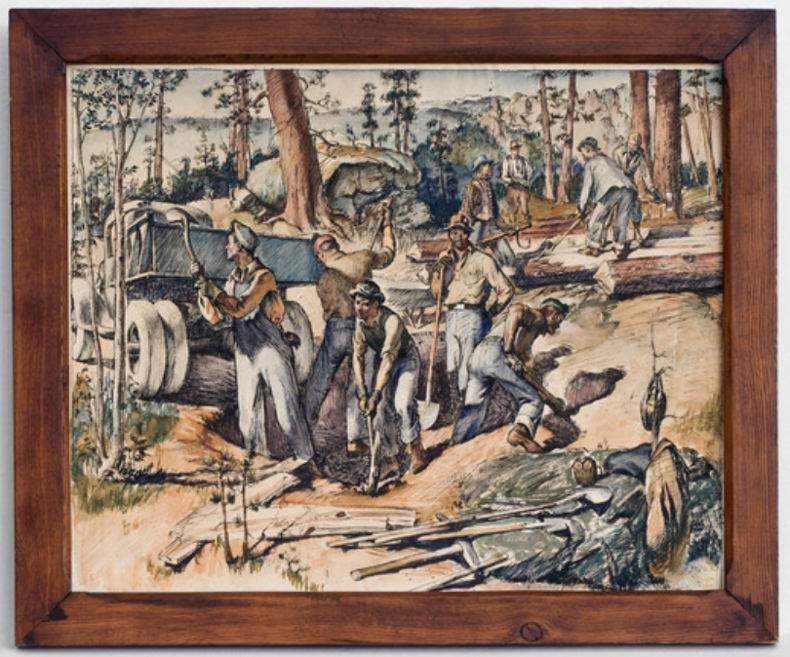 Several individuals portrayed in the painting, including the project superintendent, have been tentatively identified from comparing known camp photos. Kathleen Duxbury, NNDPA Board Member and an authority on CCC art, tipped off the museum that the piece was available. After two years of negotiations, the painting came home to the Black Hills. The museum is located at 23935 Highway 385, Hill City, SD. From there it is thirteen miles to Camp Pine Creek and Mt. Rushmore is just another mile. Before Gollub was in the CCC he was a student at the City Art Museum of St. Louis, his hometown. The director of that museum wrote letters of recommendation endorsing placement into the Cs art program. In his letter of resignation from the CCCs Gollub noted "Perhaps an explanation is in order for the reason that I've sent in no other work besides two pretty poor landscapes. I've been engaged in doing some of the Park Wild Life, a subject of particular interest to me. These are to be (I hope) placed in the State Park Museum." You may have seen Gollub's work and not even realized it. He went on to become an artist for Walt Disney and one of his projects was on Rudyard Kipling's "The Jungle Book." He enlisted in the Navy during WWII where he was a reconnaissance photographer. One of his post-war jobs was with the Western Printing and Lithography Company where he drew comic book covers including for the Lone Ranger, Raggedy And & Andy and TUROK. Do you remember these from the 1950s? Stop at the CCC Museum of South Dakota to see this Gollub painting.